When it comes to taking care of your nails, getting a manicure is not the only option. In fact, you must take care of your nails on a daily basis. Here are some simple tricks and tips that will help you do so. Take a look. All problems start with germs and bacteria. You must make sure that there is no scope for them to breed. Clean your nails regularly and make sure you dry them after washing. This also prevents dirt and bacteria from accumulating under your nails. However, don’t overdo it; nails soaked in water for long durations may lead to splits. When you need to wash dishes, it is best to protect your fingernails with gloves. You also need to ensure that the skin around the nails is clean and dirt-free too. What we recommend is you take a toothbrush and apply some salt onto it and use it to scrub your nails and the skin around them gently. Biting your nails causes a lot of damage. In addition to making your nails look pathetic, the contact with your saliva makes them weak and brittle. It also harms your cuticles. Also, putting fingers in your mouth transmits the dirt and germs from your fingers to your mouth. We advise you to apply a nail paint that smells bad and puts you off to help you stop biting your nails. Cuticles are very delicate and get ruptured easily. 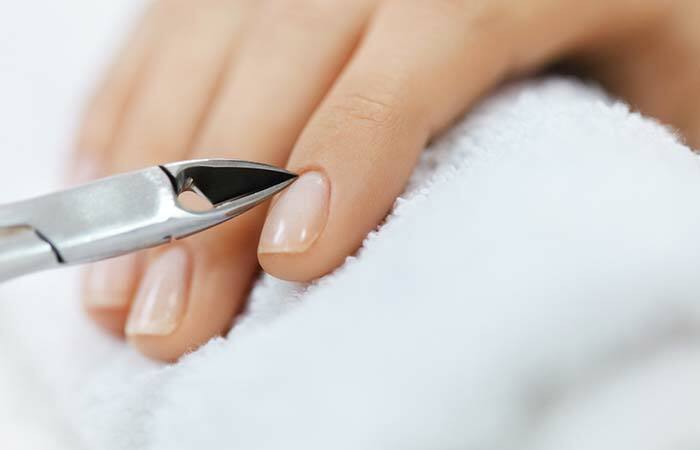 Taking good care of your cuticles is a crucial part of nail care. If you have hanging skin or nail, handle it carefully – trim it gently so that it doesn’t stick out or cause more pain. Do not bite or pick the cuticles. Make sure you moisturize your cuticles – apply either coconut or almond oil to the cuticles and massage gently to nourish them. Clean your nails regularly and make sure all your nail tools are periodically washed and sanitized. Make sure that your nails don’t grow too long as that makes it easier for the dirt to accumulate below the nails. 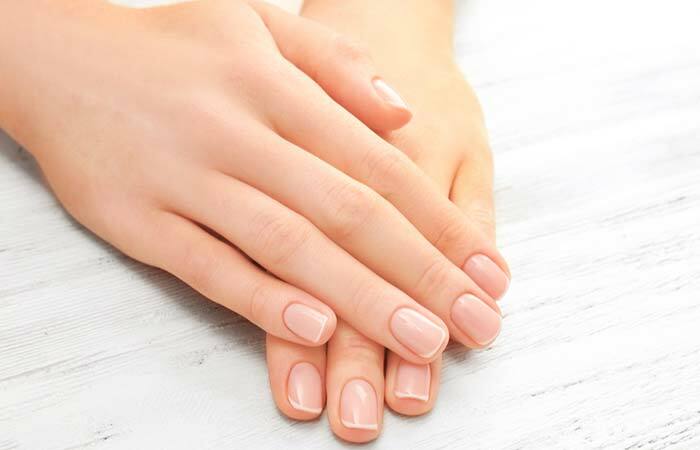 Apply natural disinfectants on your nails like tea tree oil to keep the bacteria away and protect your nails from germs. Dry and flakiness are as bad for your nails as they are for your skin. Nails are very delicate and tend to break off easily. Moisturize them to make them strong. Choose from a range of hand creams, cuticle oil/creams or moisturizing oils that will help keep your nails and cuticles shiny and healthy. 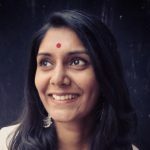 Similar to how trimming your hair regularly is good for its health, the same goes for your nails. Take a nail cutter and cut them neatly. Take out some time every few weeks to trim your nails and shape them in a manner you like. It is best if you trim your nails in a straight line and then either square or round them off at the tips. Base coat forms a protective layer on your skin and prevents your nails from getting discolored and stained. It makes the polish look better on your nails. Applying it thick on your nails will enhance the color of your nail polish. So, the next time you decide to paint your nails, do not skip applying a base coat – because it is worth it. A top coat helps your nail color last longer. It also adds a shine to your nails and prevents them from chipping off easily. You can choose from a range of top coats depending on the look you are going for – if you want a matte finish, choose a matte top coat. A good nail trick is to apply a top coat to your nails every few days to help keep your manicure stay on longer. Scraping off your nail polish is the worst thing you can do to them. It makes your nail surface rough and patchy. It also strips away the top layer of your nails. Also, to prevent the polish from chipping off on its own, you must apply the nail paint in two rounds of thin coats instead of dousing it in one thick layer of color. Instead of hurriedly scraping off your nail paint to avoid the chipped nail polish look, carry a few nail polish remover tissues. If you do your household chores yourself, then this is for you. A lot of your cleansing detergents contain chemicals and will cause harm to your nails when they come in contact with them. 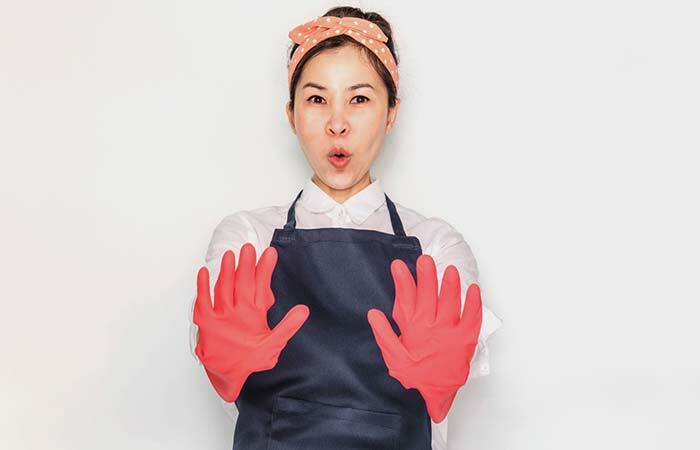 A simple solution is to wear gloves and happily go about your chores without worrying about your nails. Make sure you wash your gloves thoroughly after use and hang them out in the sunlight to sanitize them. Gels and acrylics are no doubt super pretty but sadly cause immense damage to the nails. Avoid them entirely, if possible. The acrylic powder contains a lot of chemicals and roughens the nails and causes dents in them. The drying mechanism in gel manicures causes harm to the skin around your nails. A smarter alternative for this would be to choose press on ones if you are hellbent on this particular nail look as they are less harmful and easy to apply. File slowly and gently, and in one direction. Otherwise, the nails get weak and break prematurely. Filing in the same direction also helps you achieve a smooth tip and makes it easier for you to shape the tip in a manner you want. Filing them in an aggressive manner blunts your tips and leaves no scope of shaping them. Begin to file from one corner to the center and then from the center to the other edge or vice versa. 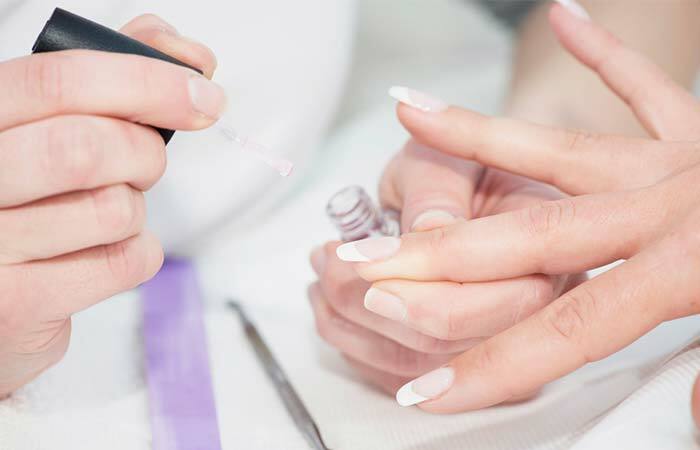 This process helps you achieve a smooth finish and doesn’t harm your nail beds. Avoid water-based manicures because the nail polish tends to chip away faster. Your nail bed absorbs water and expands when dipped in water and goes back to its original shape after being taken out of the water. Applying nail polish when the nail bed is expanded is not good because once it shrinks, the nail paint cracks, leading to chipping. Instead, go for an oil-based manicure, where you cleanse your nail and nail beds with an oil-based formula. You need to be very careful while picking a nail polish. Paraben and sulfate filled ones are bad for your nails and the skin surrounding it. Also, eating with hands that have paint on its nails is not a good idea as bits of the nail paint can chip and fall into the food, which will eventually go inside your body and cause harm. Instead, choose natural and chemical-free nail paints that are eco-friendly and cruelty-free. An au naturale look is alluring any day. 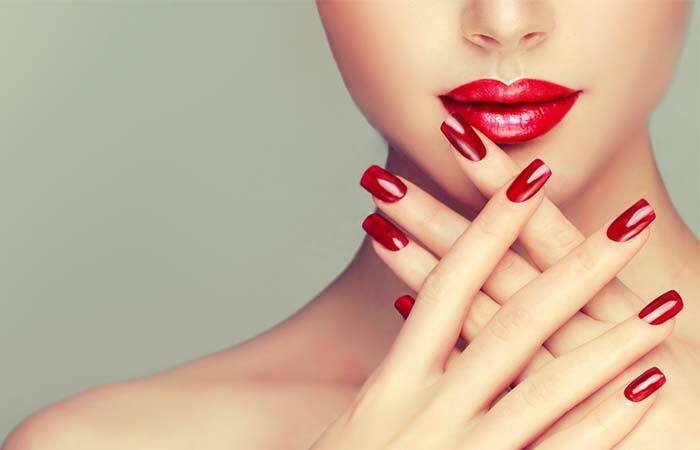 Instead of painting your nails, which is still putting chemicals on your nails even if you choose the most natural brands available in the market, buff your nails. Buffing elevates the nails and adds a shine to them. It is essential that you remember to buff gently and not too often to avoid spoiling the texture of your nails. Treat your nails well. Give them regular nourishing treatments to keep them strong and healthy. One way is to soak them in salt water for a few minutes and then dry them with a clean towel. Do this 2-3 times a week for healthy-looking nails. Using a cuticle softener after the treatment to nourish your nails. You need to follow a series of steps for that. Start by cleansing your nails with vinegar. Soak them in water, then, apply a base coat. Put two layers of nail paint and a top coat on, and let them air dry. You need to reapply the top coat once in every few days to make sure the paint does not dry and chip off. In case that happens, file off the chipped nail and seal it again with a top coat. You can even add a thin layer of white coat (go the French manicure way) to fix your chipped nail. Cut your nails evenly to avoid any ingrowth. Do not let your nails grow too much. Always keep them leveled and even for a neat look. Growing nails too long makes them long and curved and causes issues like broken skin and ruptured cuticles. Best to cut them short and round them at the tips. 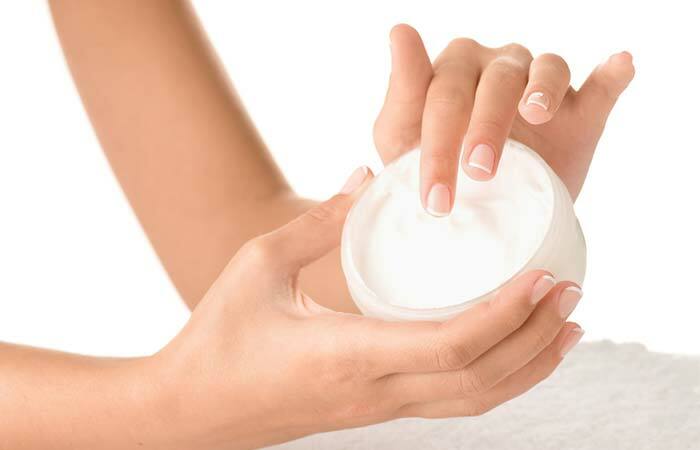 Choose nail polish removers with lesser chemicals and pick removers from good and sustainable brands. You can opt for some conditioning treatments that can strengthen your nails. Conditioners that contain CF formulas are a good choice. They hydrate and nourish your nails and make them healthy and strong. Eating well fixes everything. Nail problems are a result of a lousy diet, and issues like brittle nails result from calcium deficiency. You need to have adequate amounts of it in your food. Also add vitamin E, protein, iron, vitamin D, zinc, and magnesium to your diet in the form of nuts, beetroot, soy, beans, lentils, whole grains, greens, etc. for healthier and stronger nails. Yes, avoid nail hardeners because they contain a lot of formaldehyde that may cause splits on your nails and make them damage-prone. Always choose an acetone-free nail polish remover. Acetone is harsh on your nails and skin, and very damaging. It dries out your nails and makes them prone to breakage. Pick an emery board that is not too textured and grainy. Choose one that doesn’t hurt your nails with its rough texture and is finished in a manner that does the job well. You are bound to have some color on your cuticles while painting your nails. Clean it up with a nail polish remover for a neater manicure. Take an ear bud, dip it in nail polish remover, and gently wipe off the paint from the cuticles. Well-kept nails make a pretty sight – even better if they are strong and shiny. Maintain your nails using the tips and tricks mentioned above. Try them and tell us your experience in the comments section below. How often should I care for my nails? Make it a daily habit. Do the basics – cleanse, moisturize, and trim them regularly. How often must I moisturize my nails? Moisturize your nails twice daily.